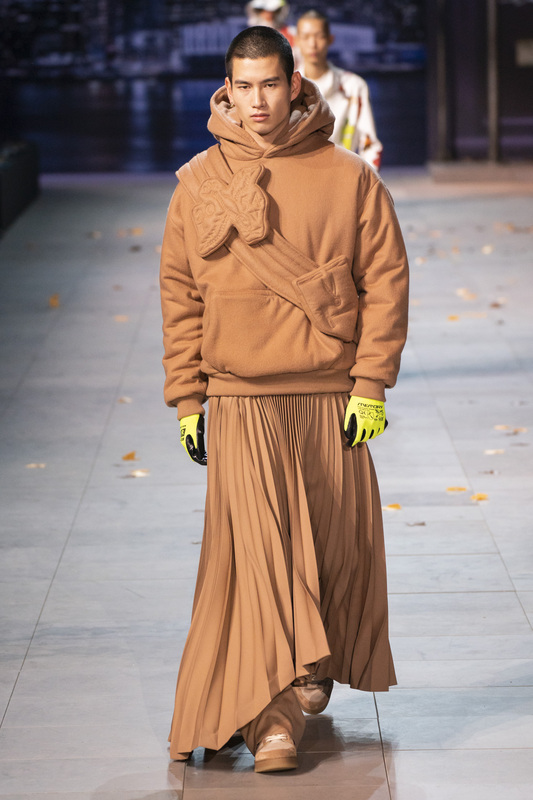 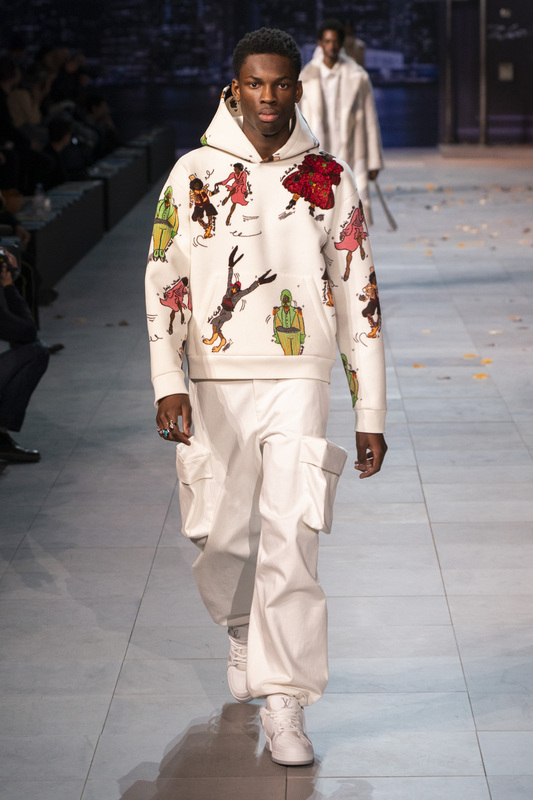 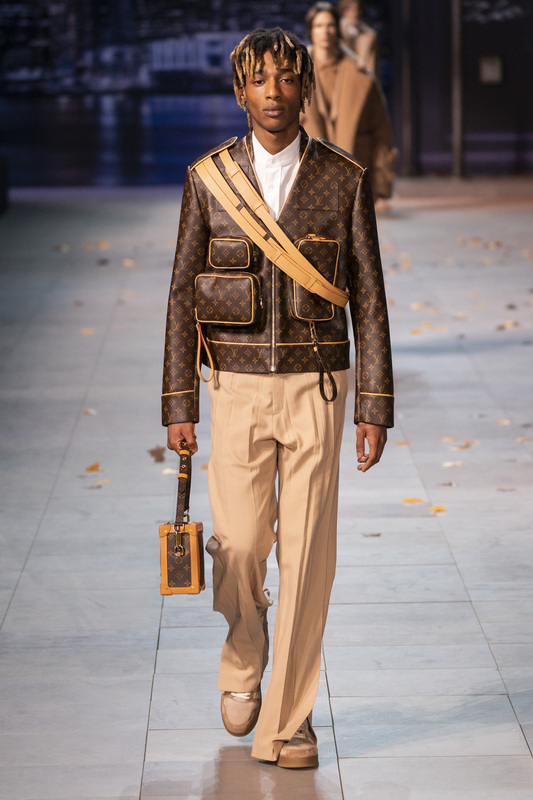 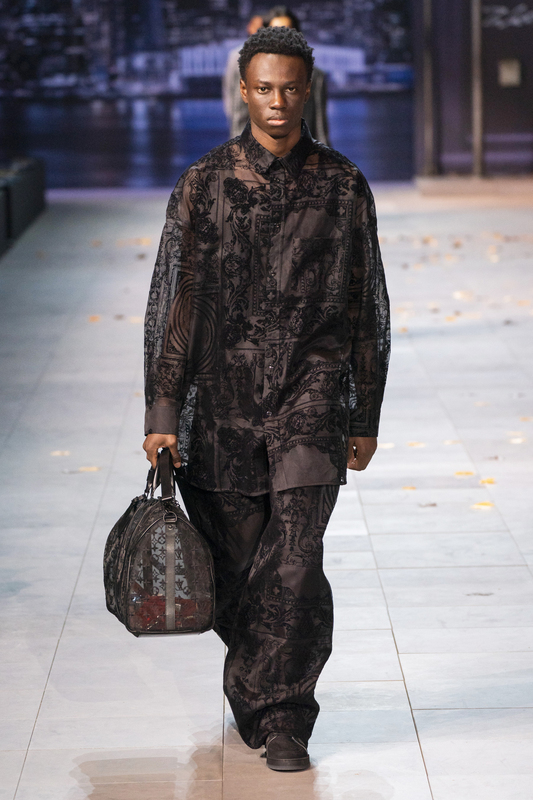 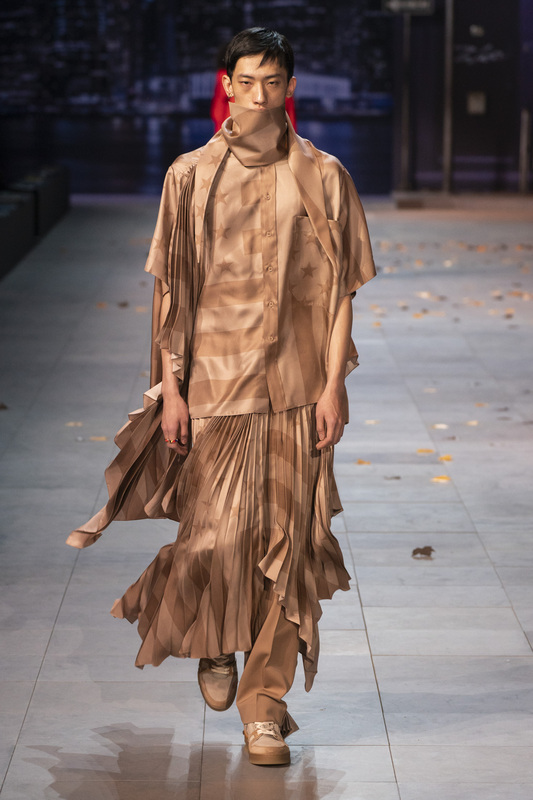 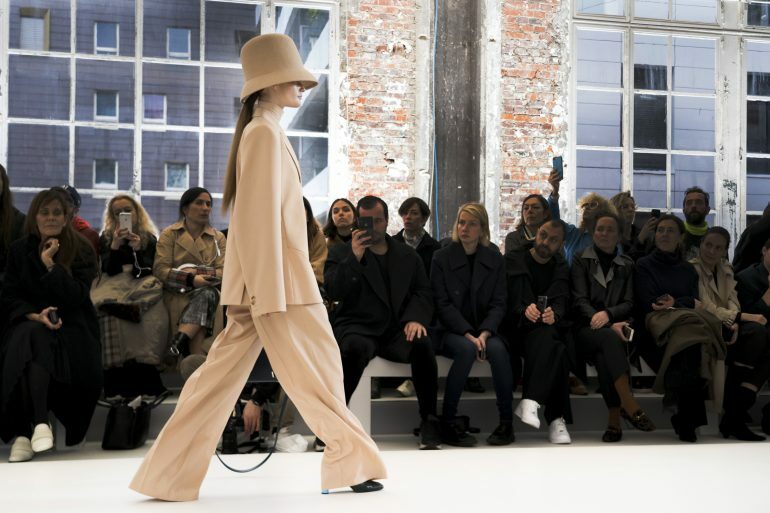 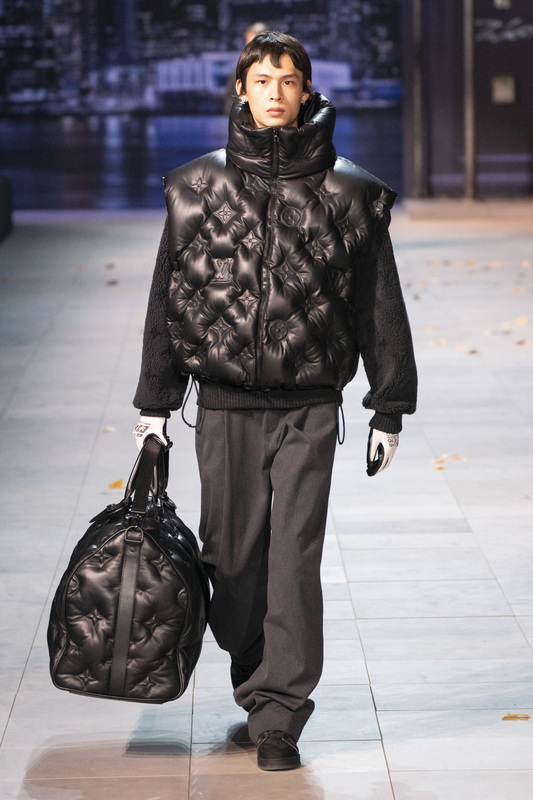 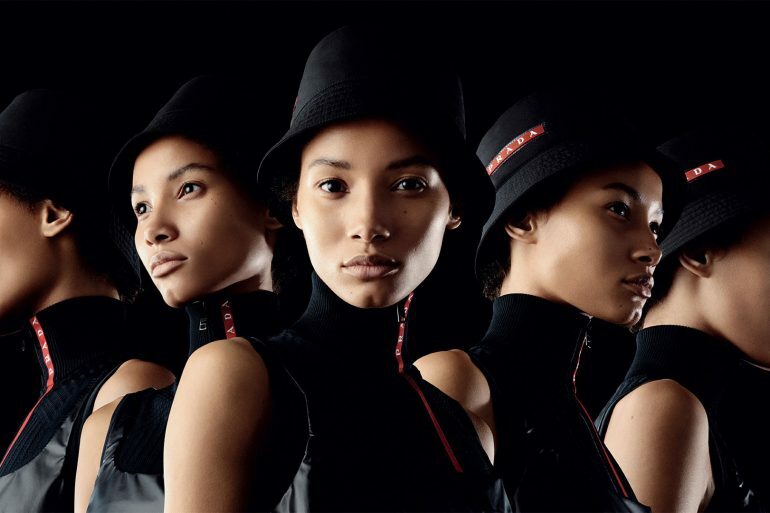 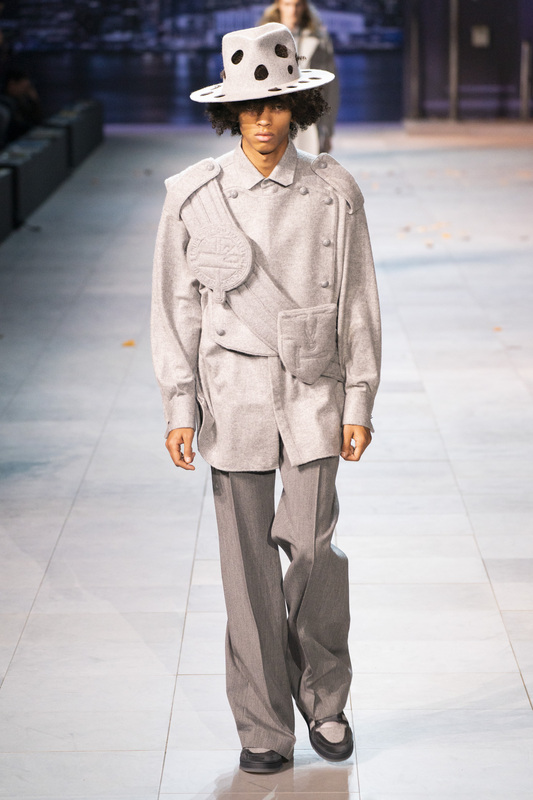 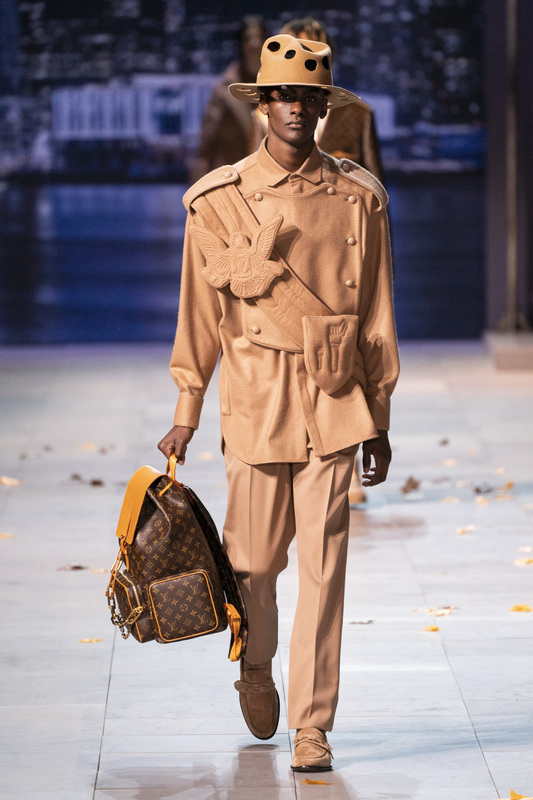 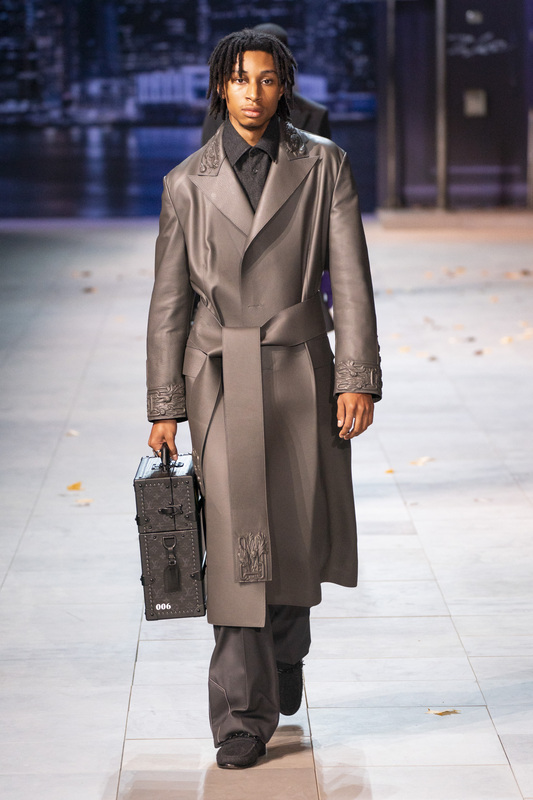 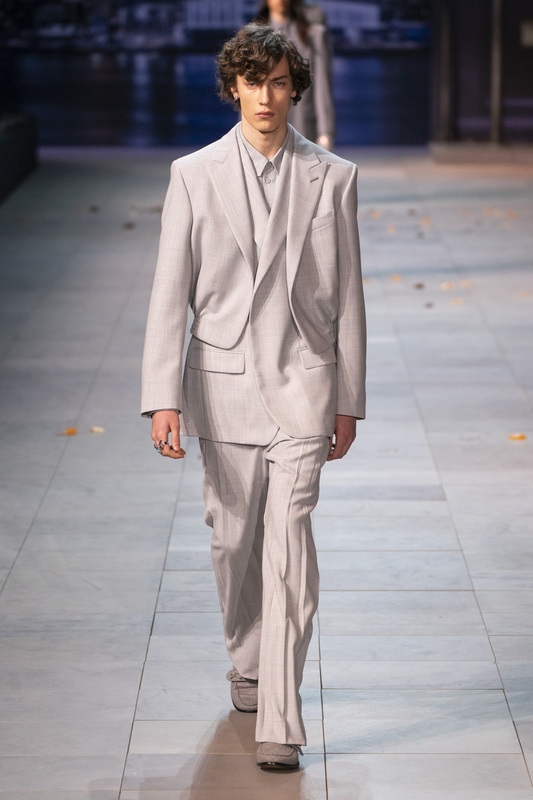 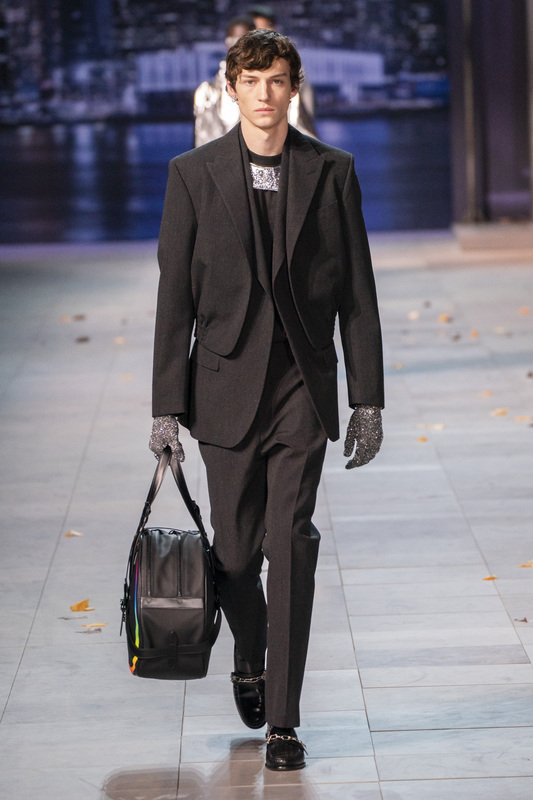 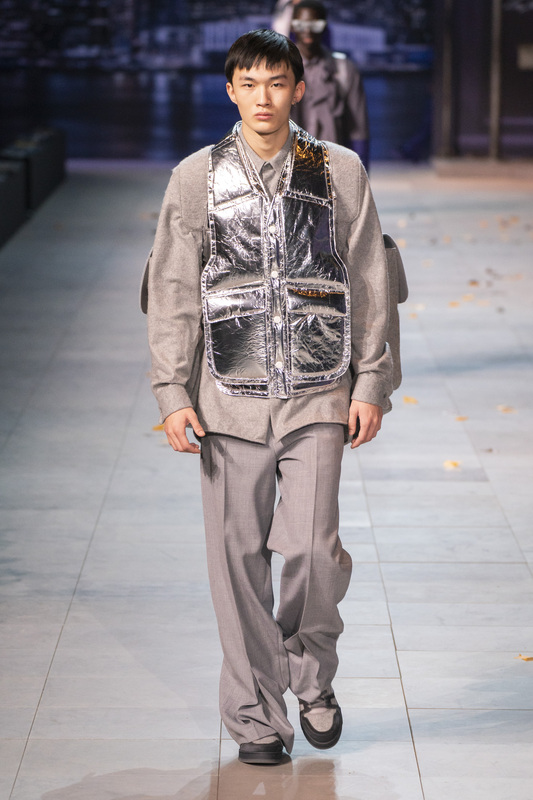 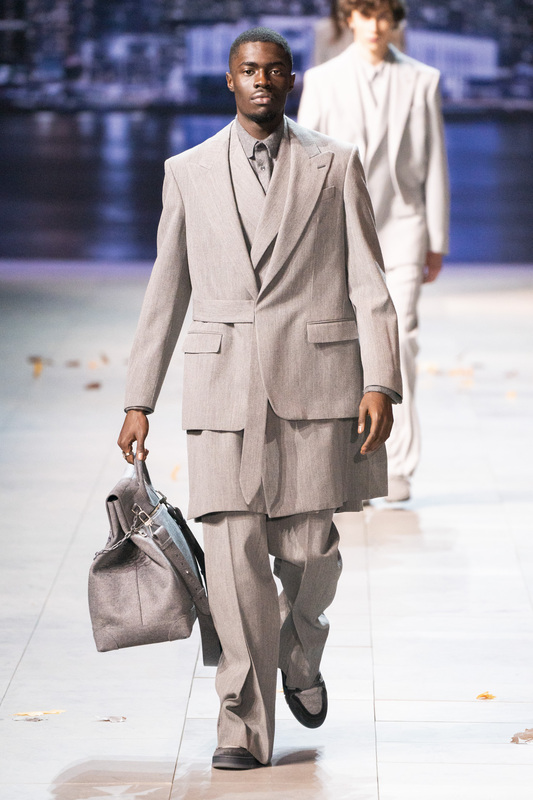 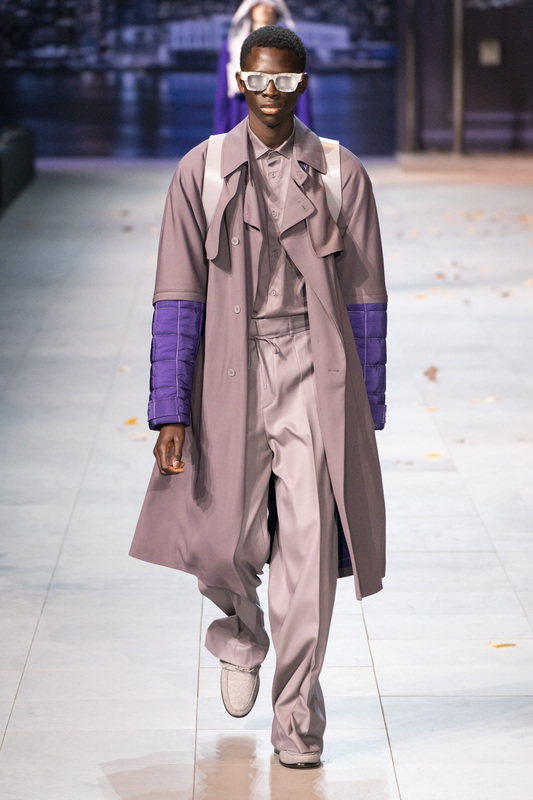 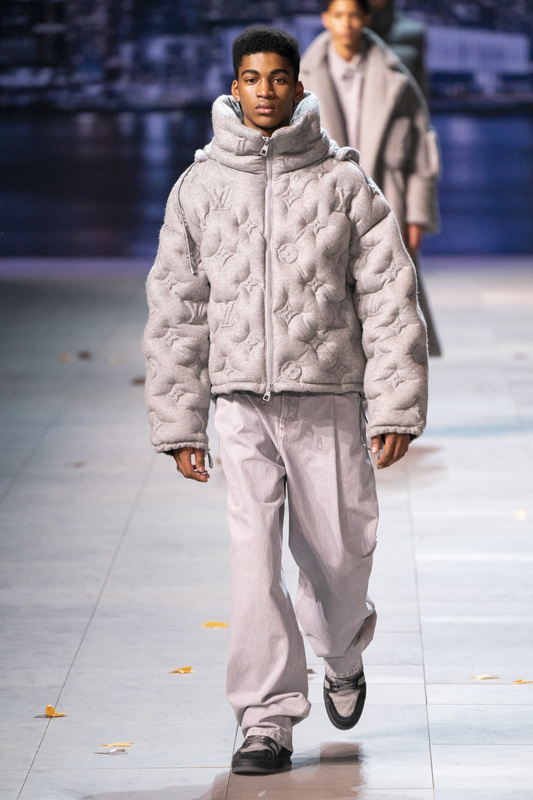 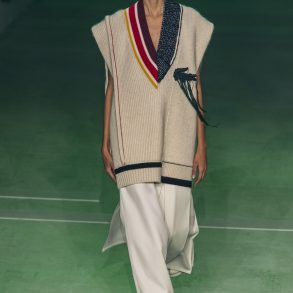 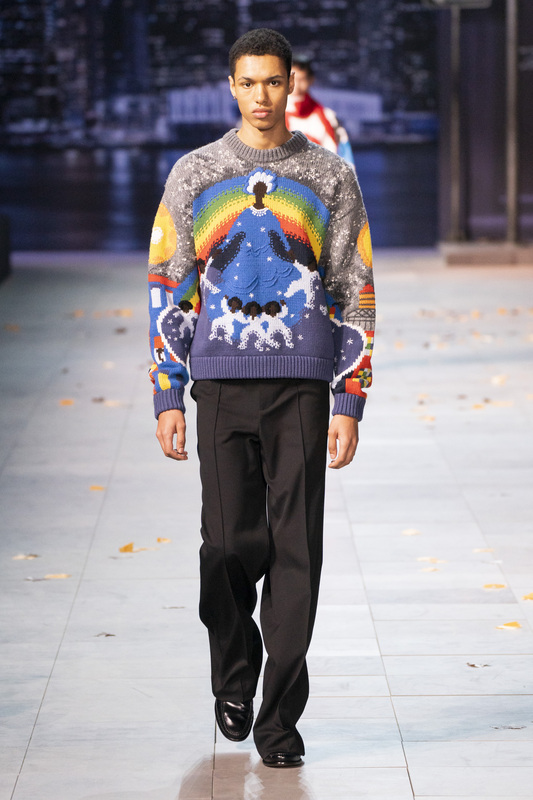 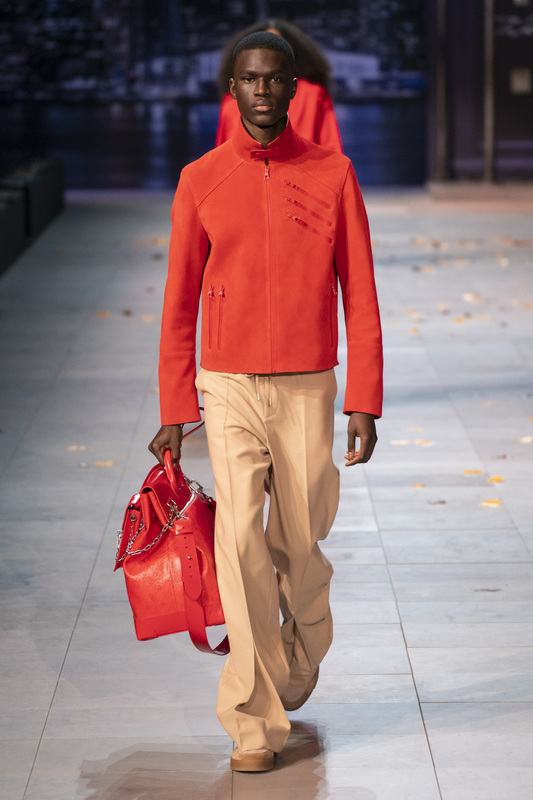 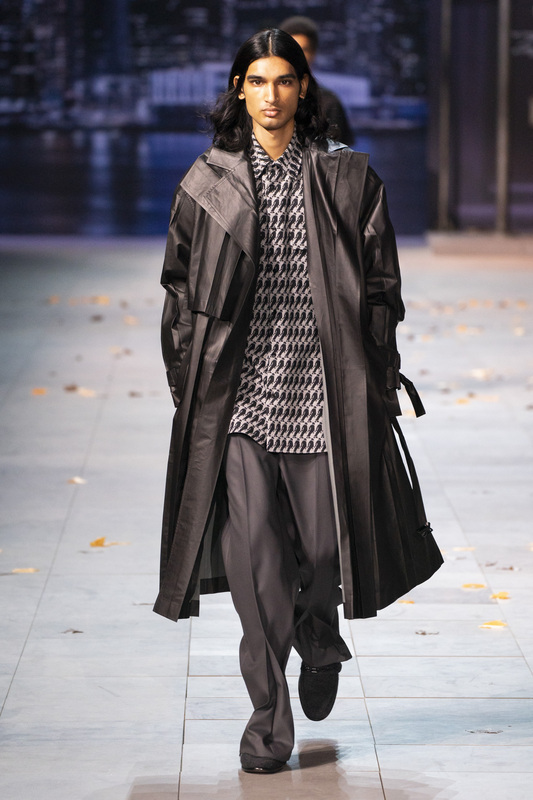 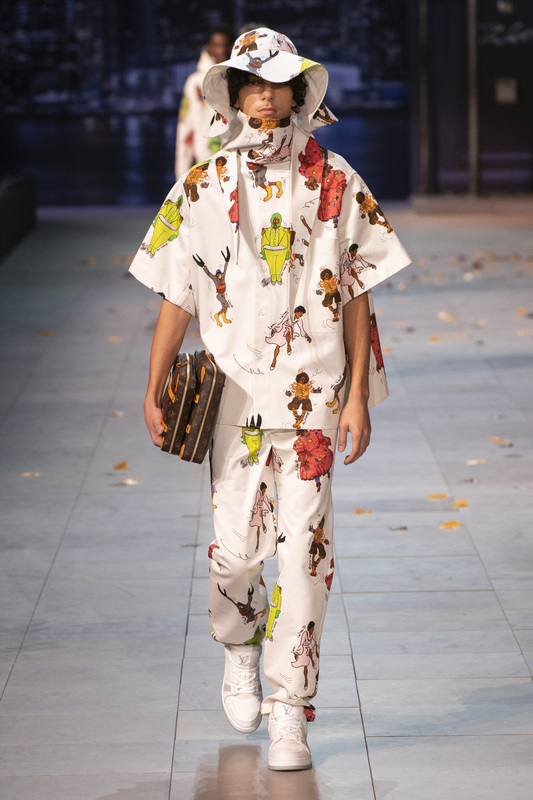 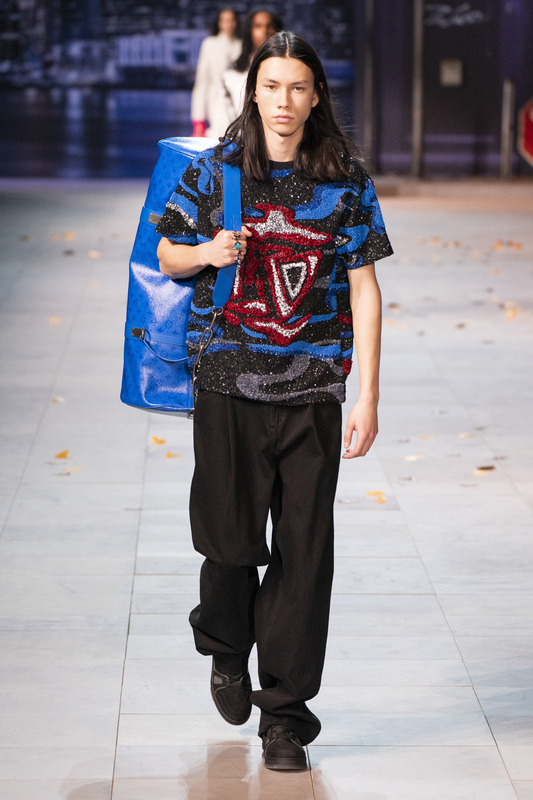 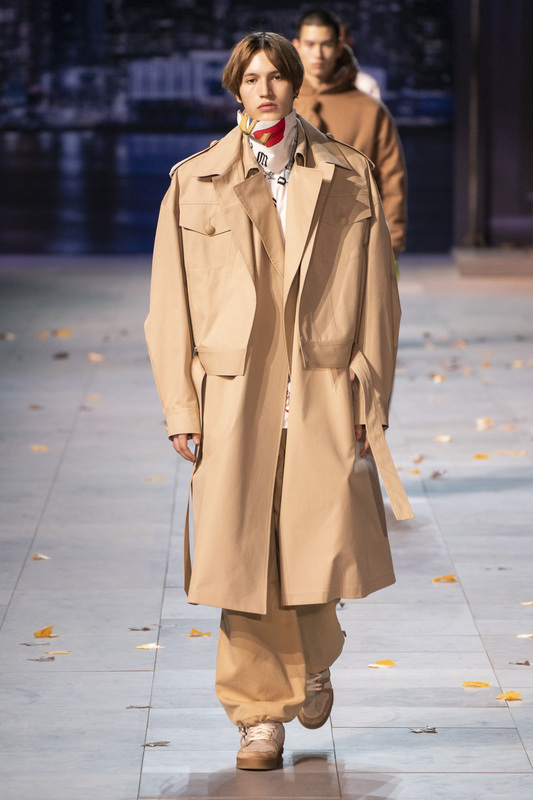 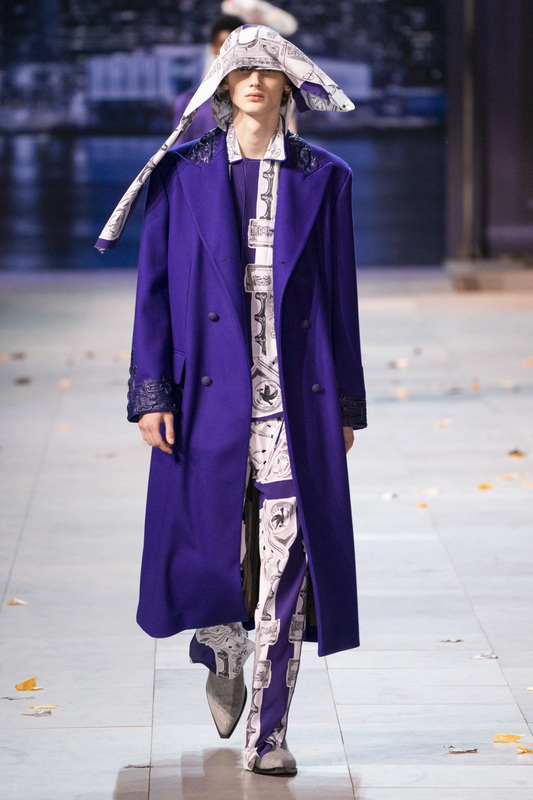 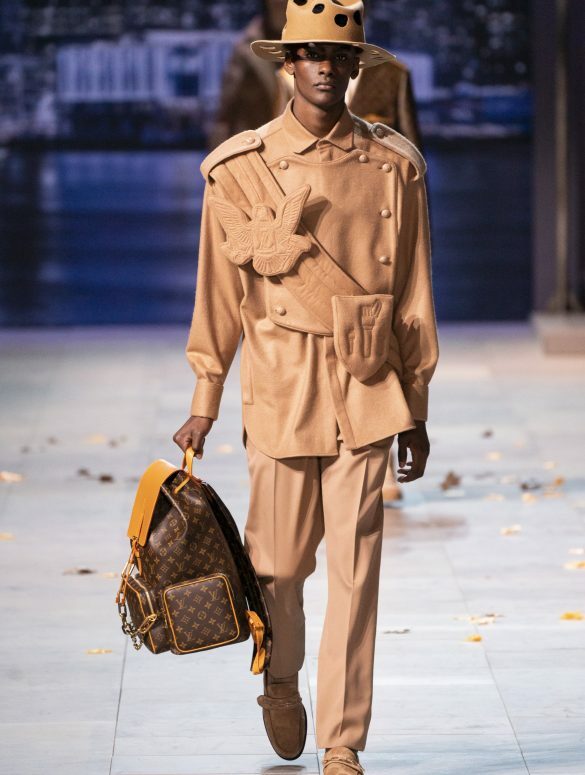 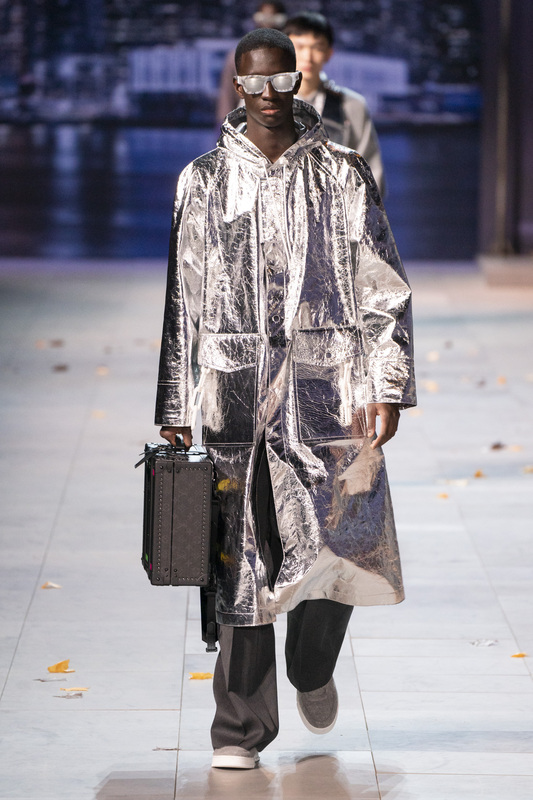 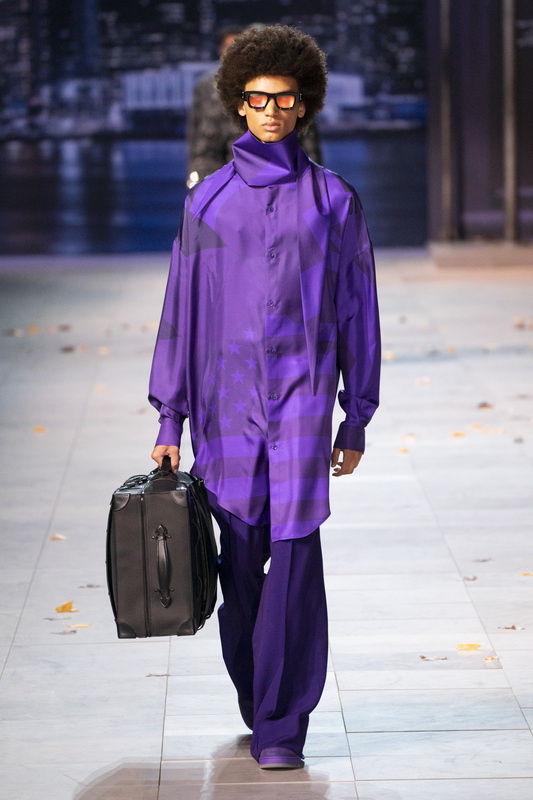 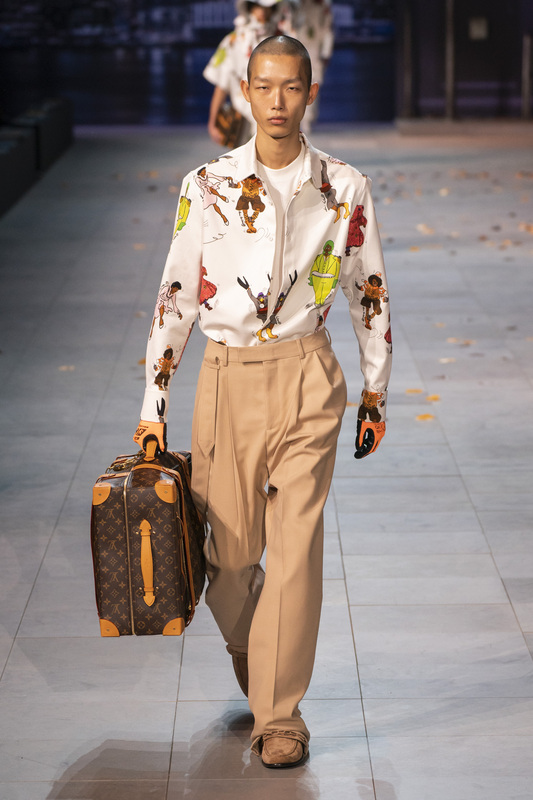 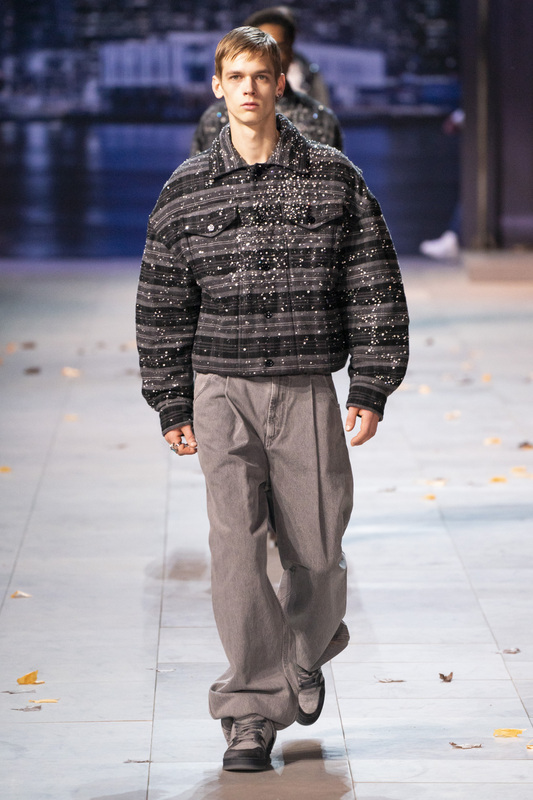 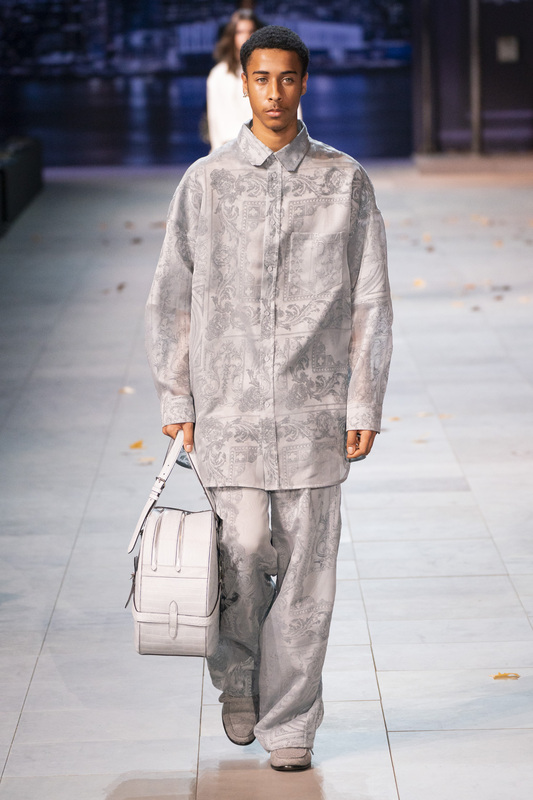 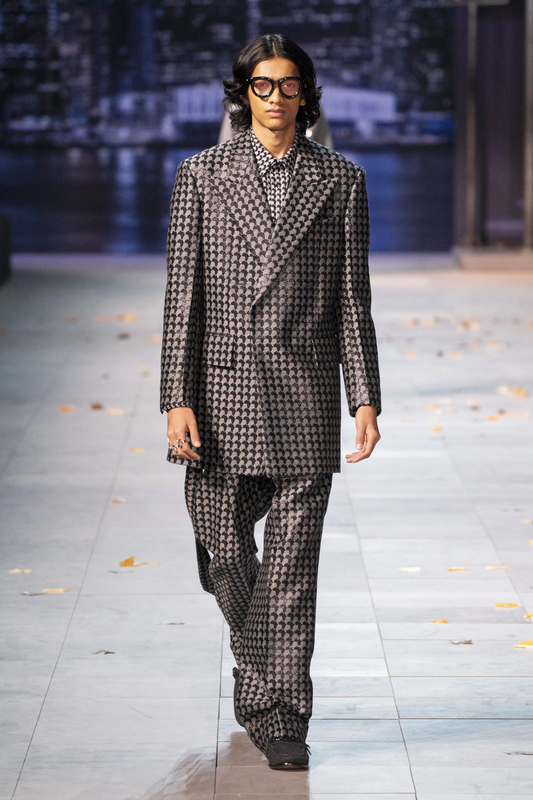 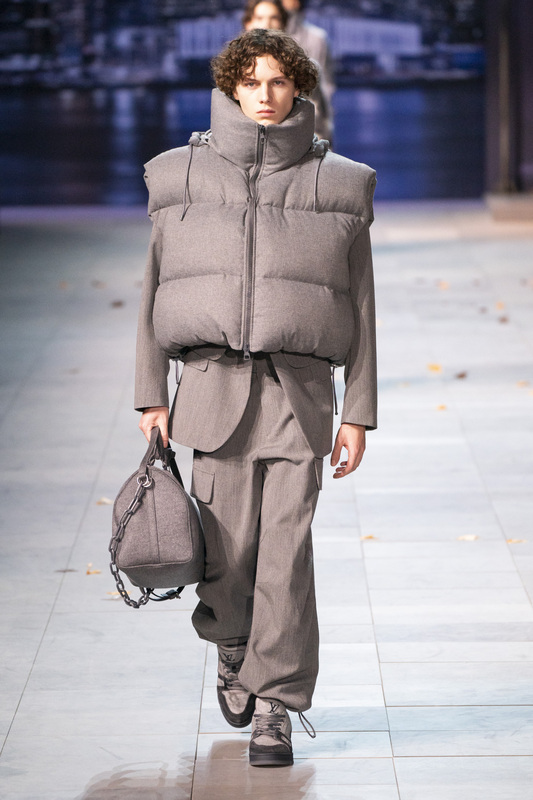 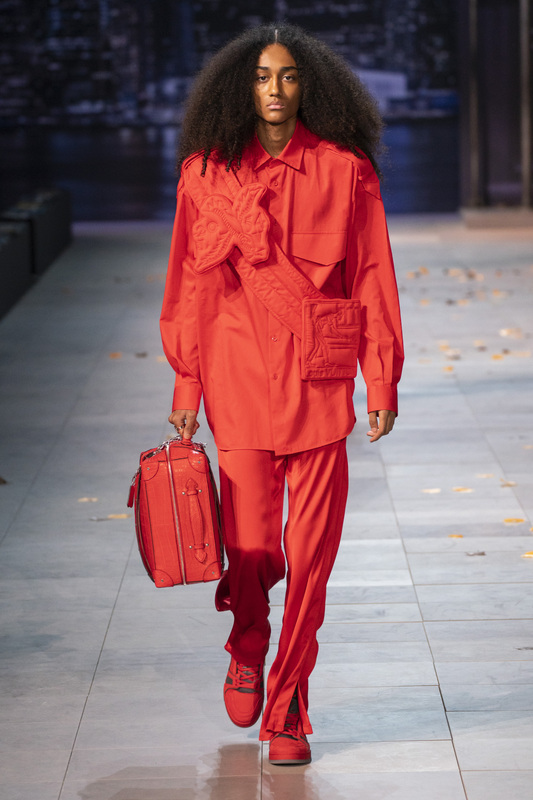 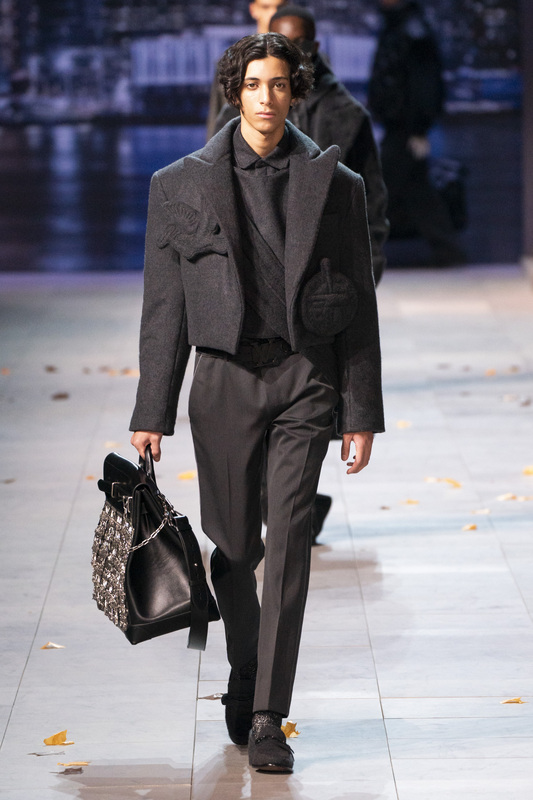 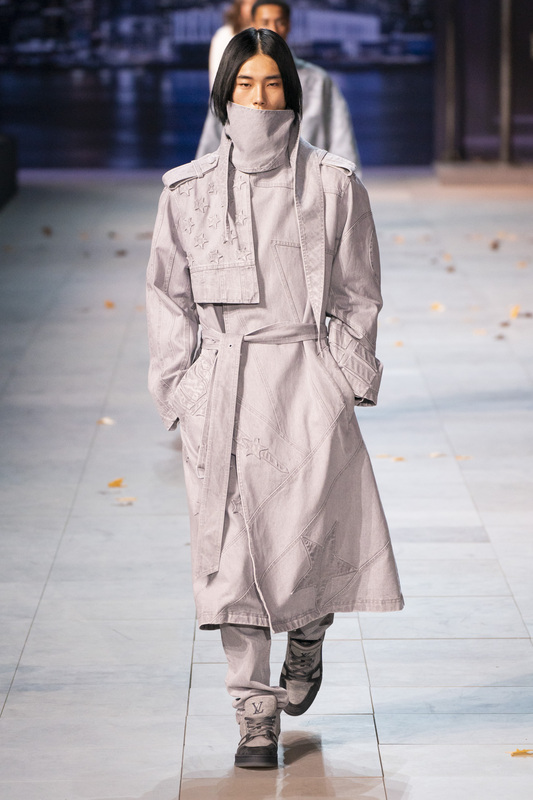 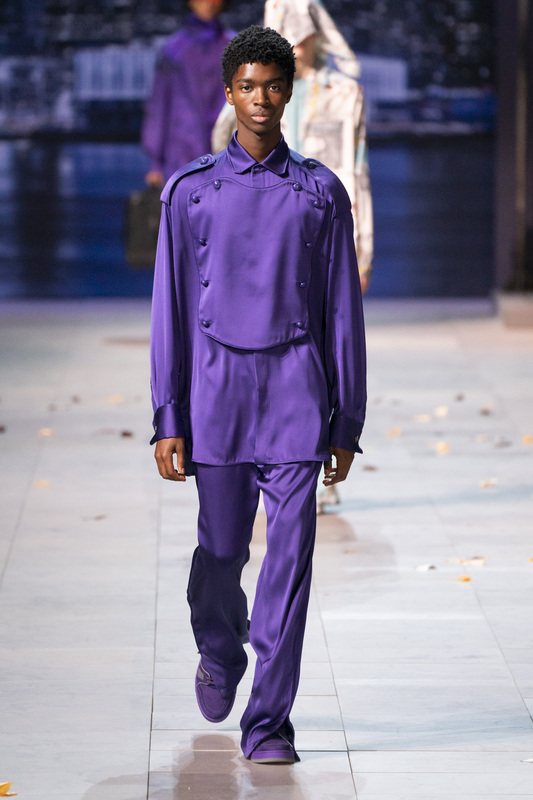 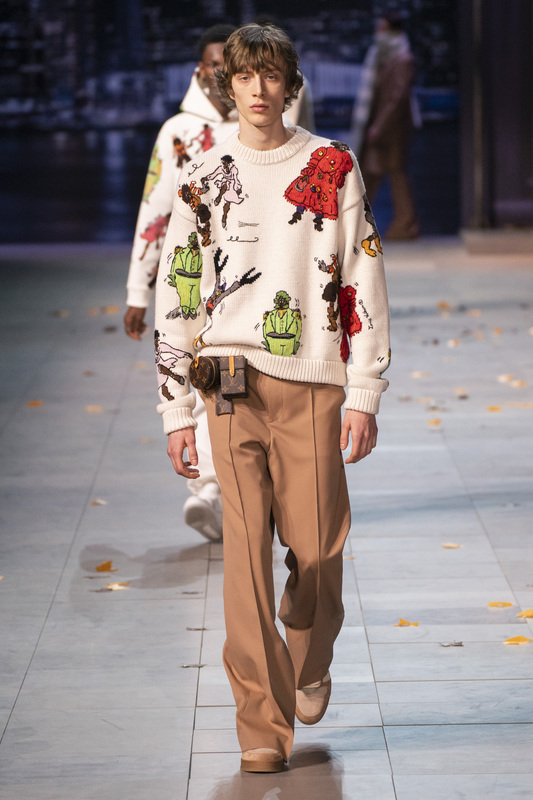 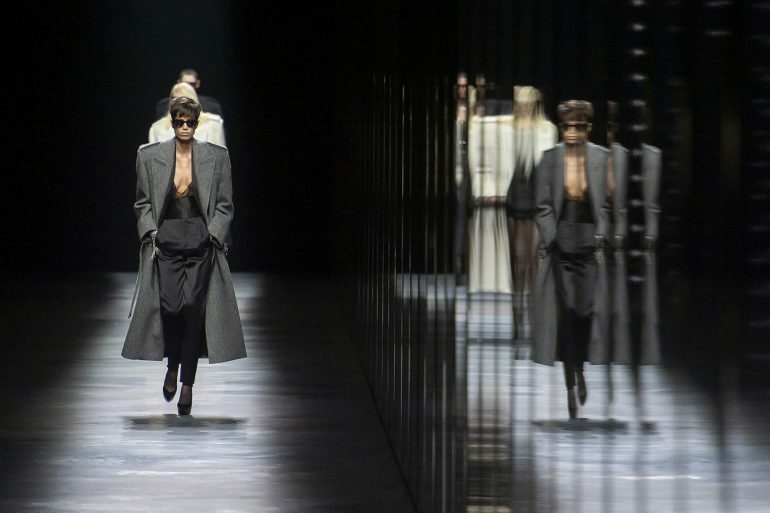 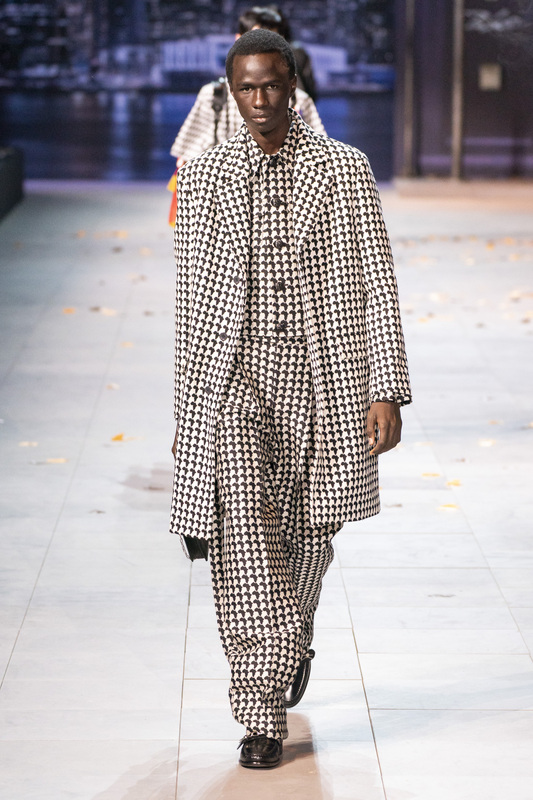 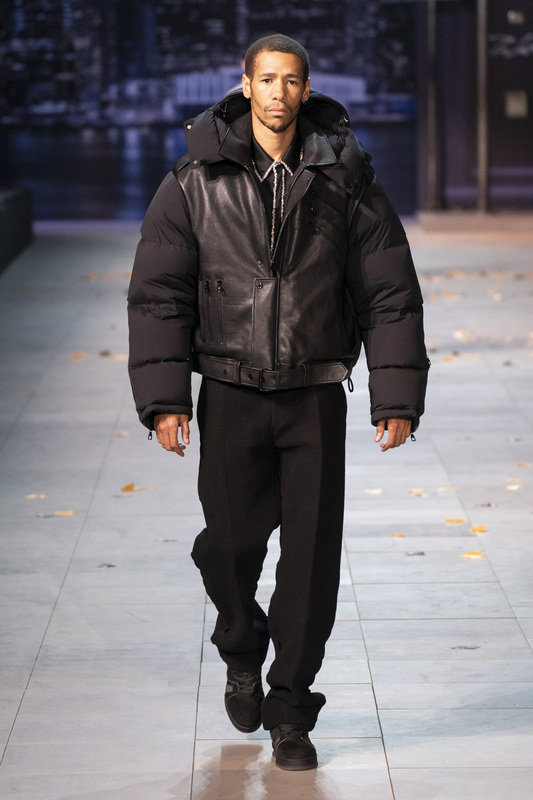 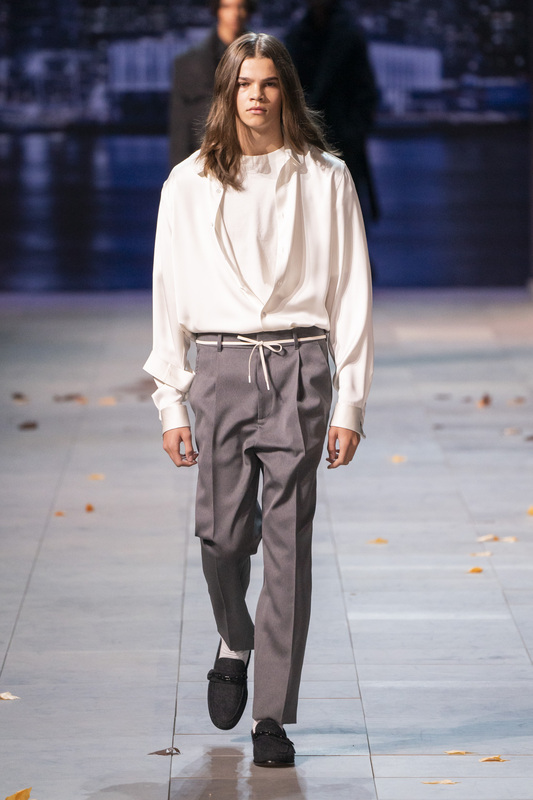 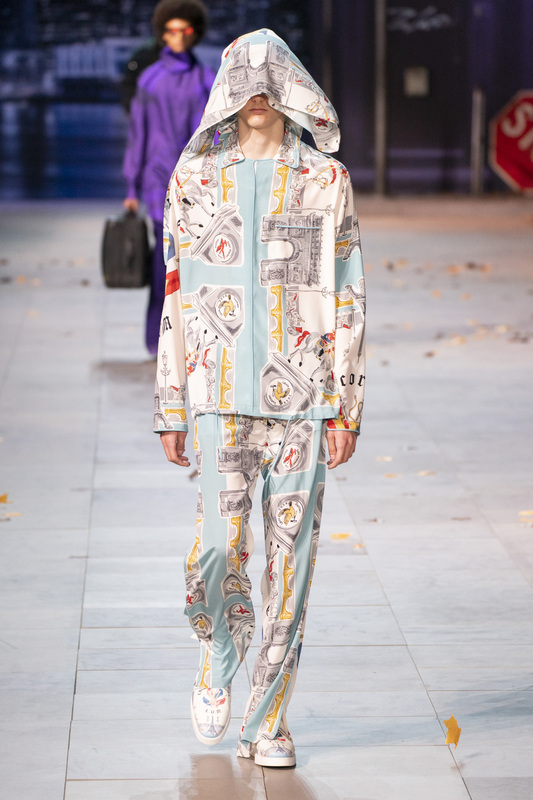 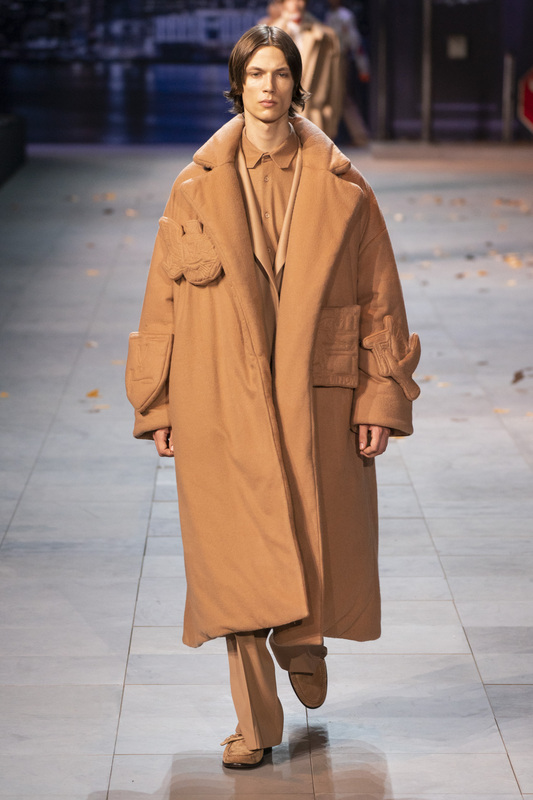 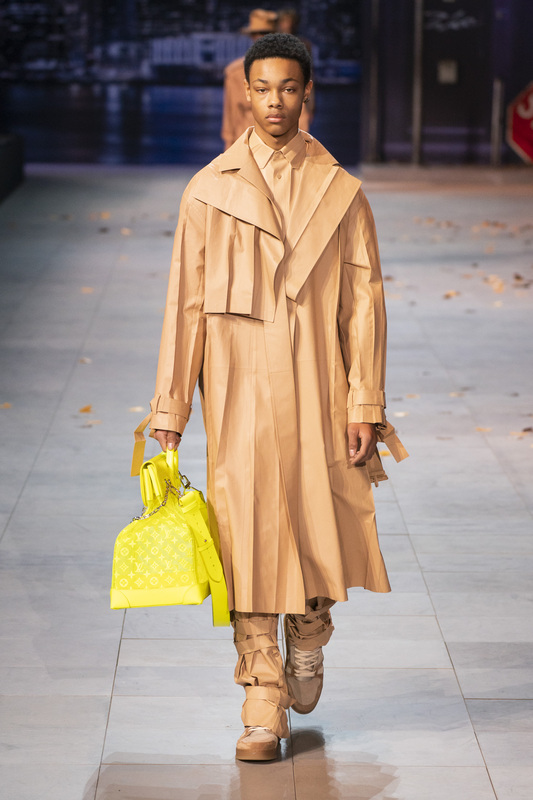 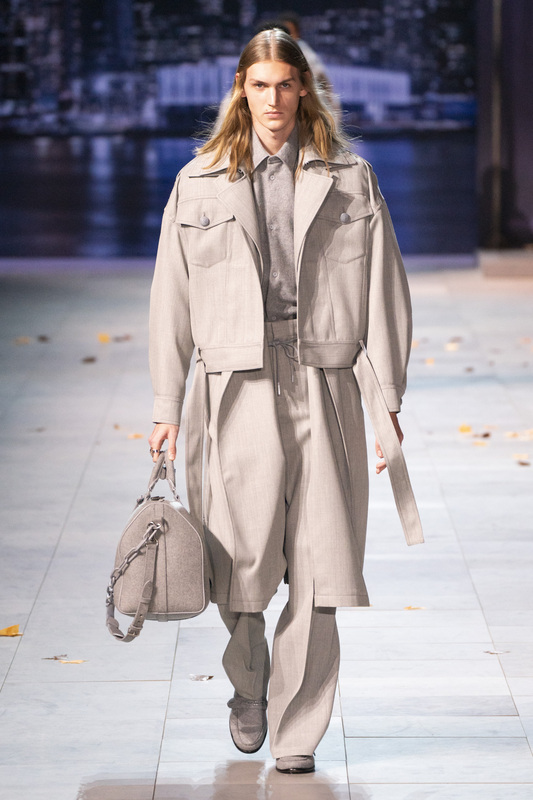 In his second menswear collection for Louis Vuitton, Artistic Director Virgil Abloh draws inspiration from ‘The King of Pop’ Michael Jackson, specifically his talent, artistry, and otherworldly stage persona. 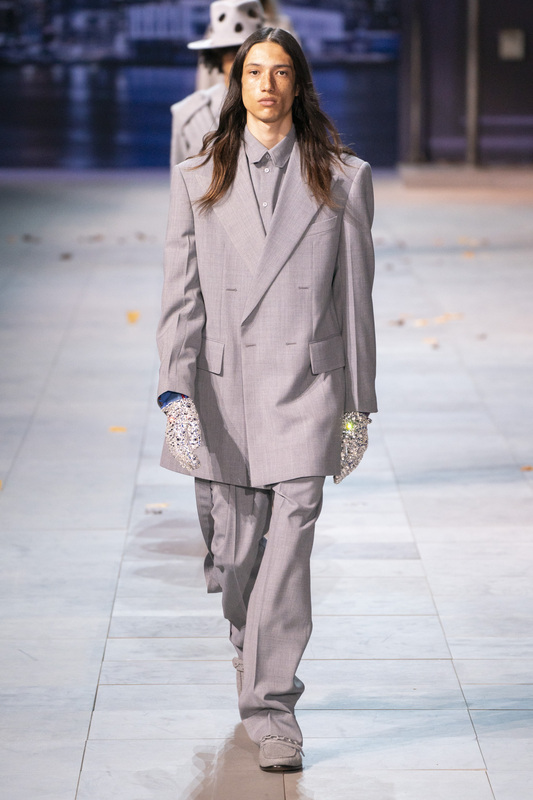 The show invite—a single, bedazzled white glove—reads, “There’s only one”, and the notes tell a tale of “a boy born in the 1950s,” who “evolved into the most recognizable and universal symbol of unity on the planet.” Michael Jackson was magic at the peak of his career from the late 1970s to early 1990s, and the Louis Vuitton FW19 menswear collection is a homage to this period. 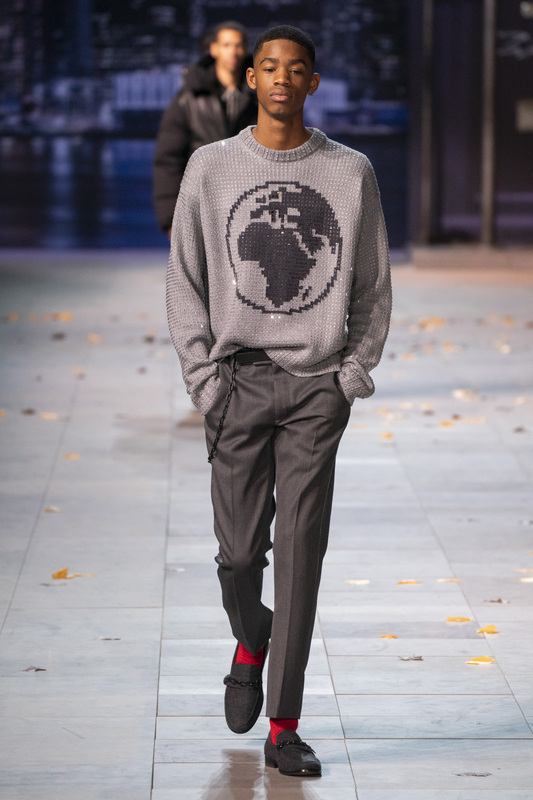 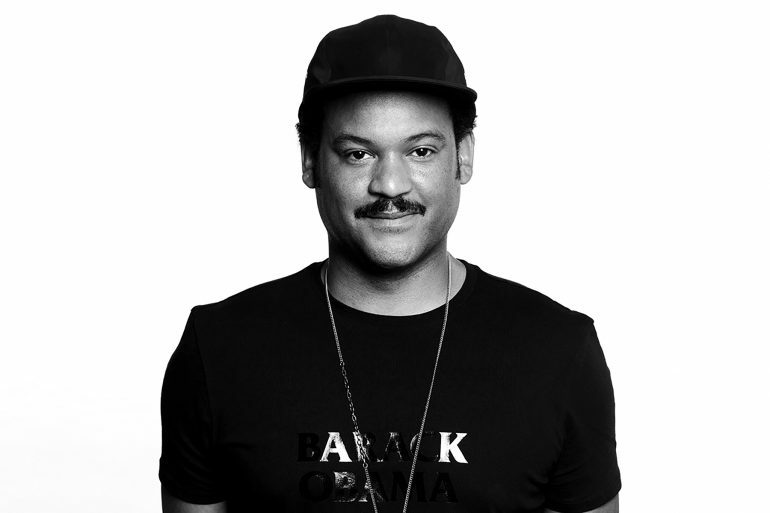 Friends and colleagues of Abloh filled into the venue at Place de la Concorde set to three of Jackson’s 1980s classics Billie Jean, Bad and Wanna Be Startin’ Somthin’. 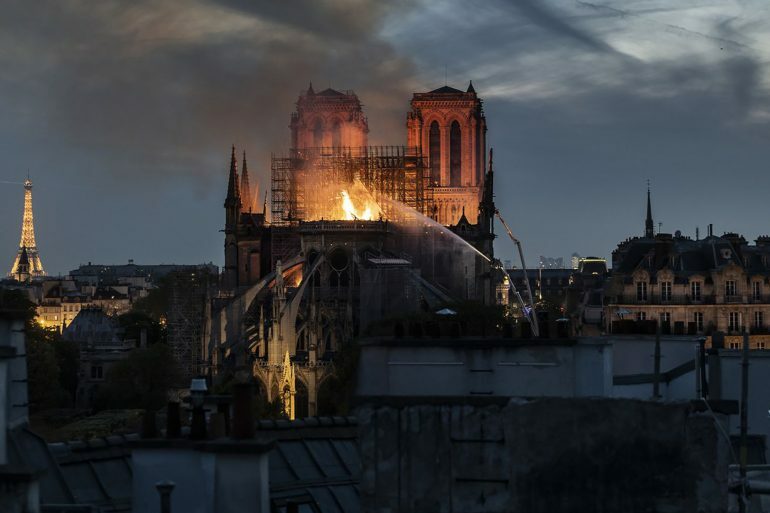 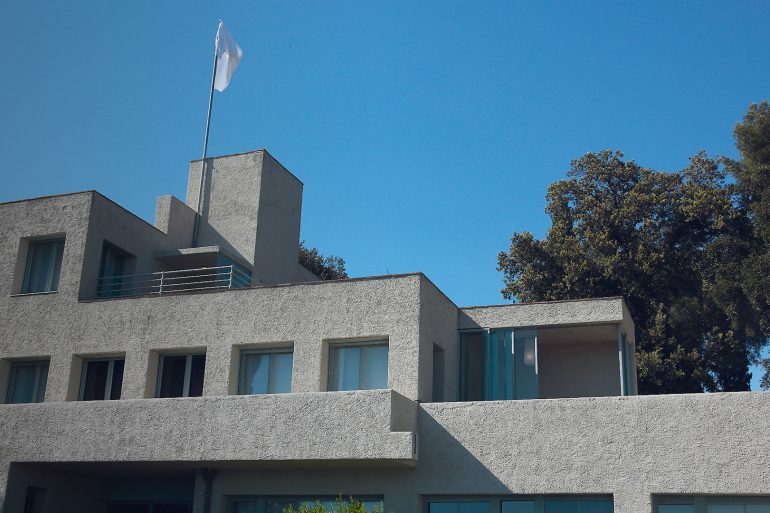 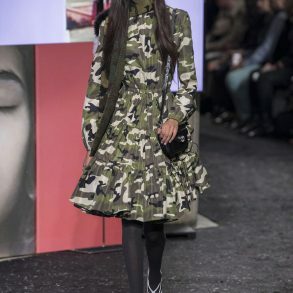 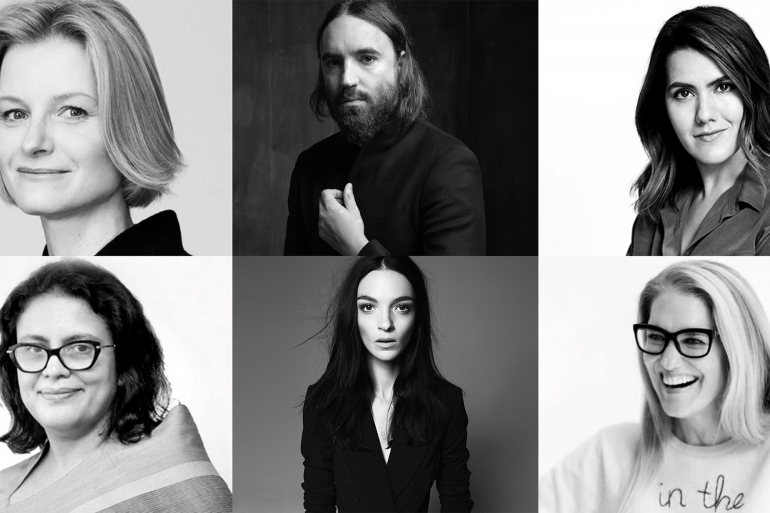 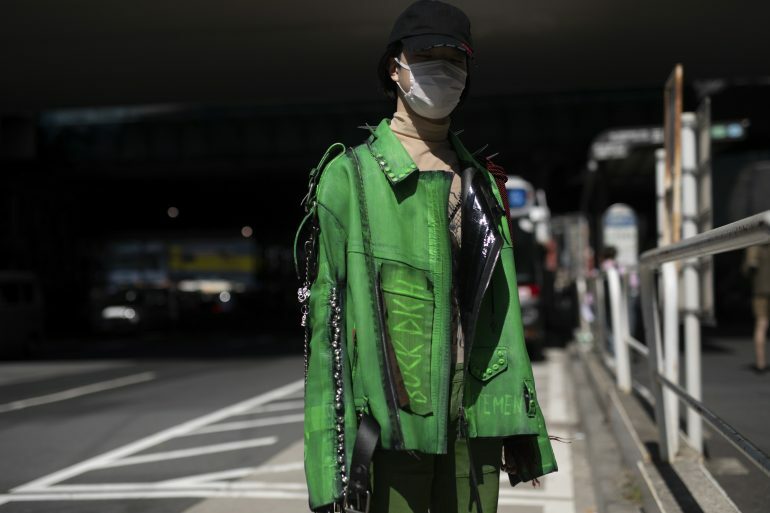 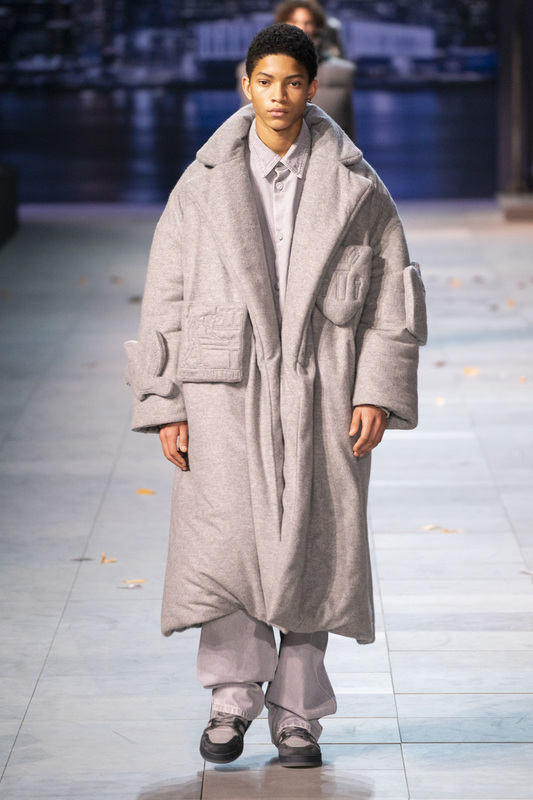 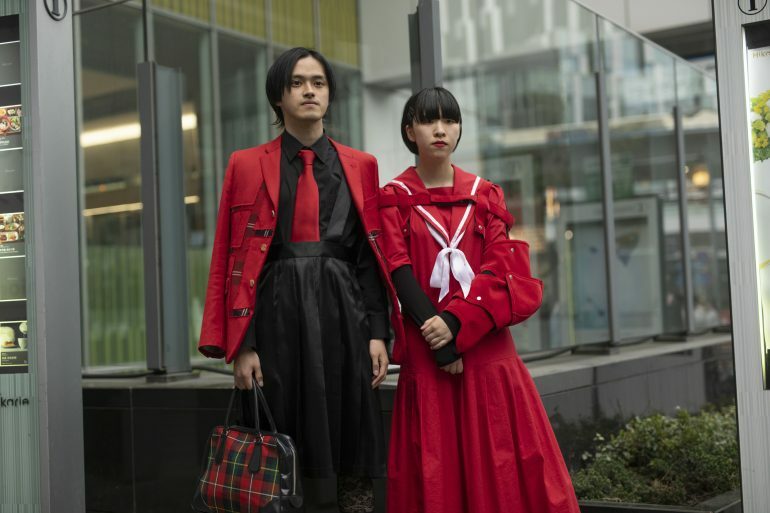 Guests included friends Heron Preston, Kid Cudi, and Don C, Naomi Campbell, actor Timothée Chalamat, singer Frank Ocean and Berluti Creative Director Kris Van Assche among others. 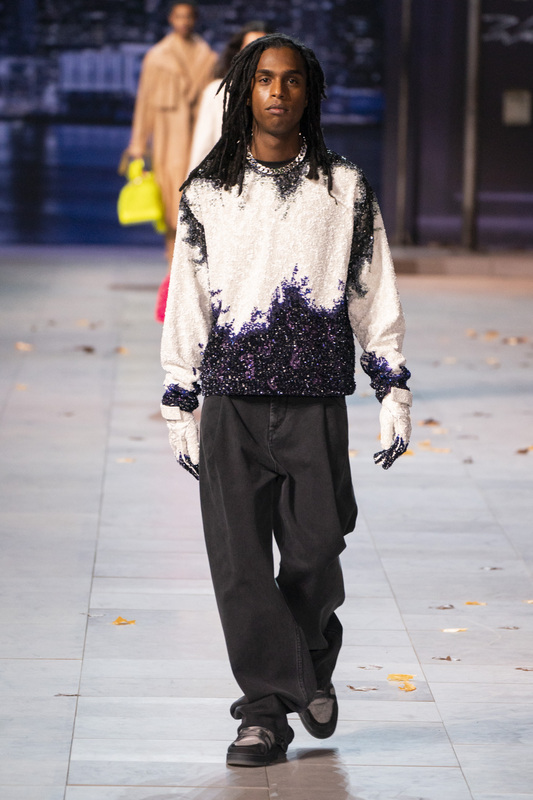 Loyal and lukewarm fans of Michael Jackson are sure to notice many references to the King of Pop in this collection. 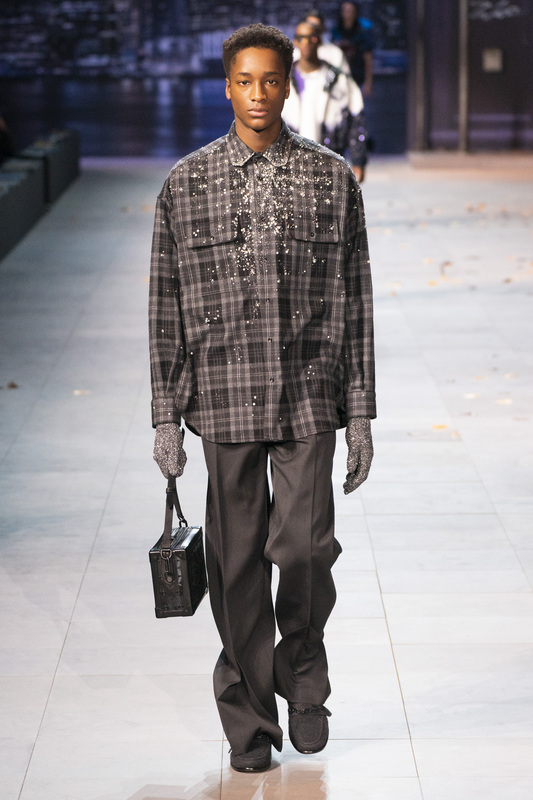 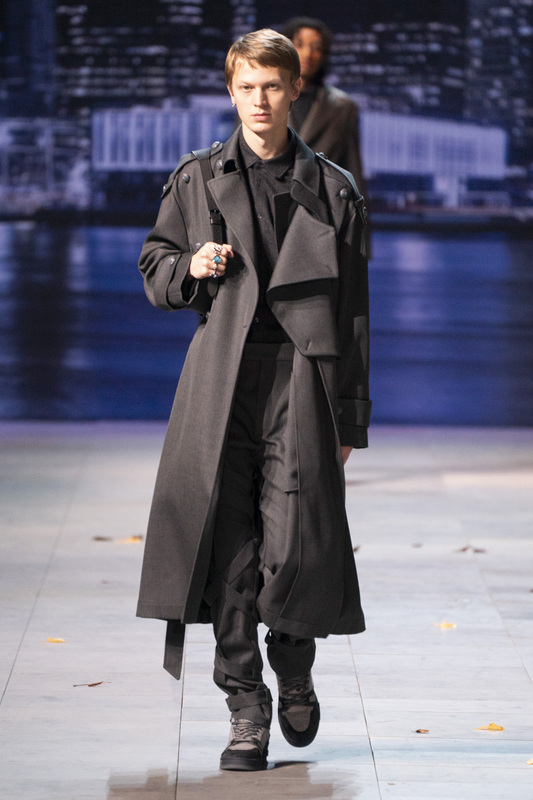 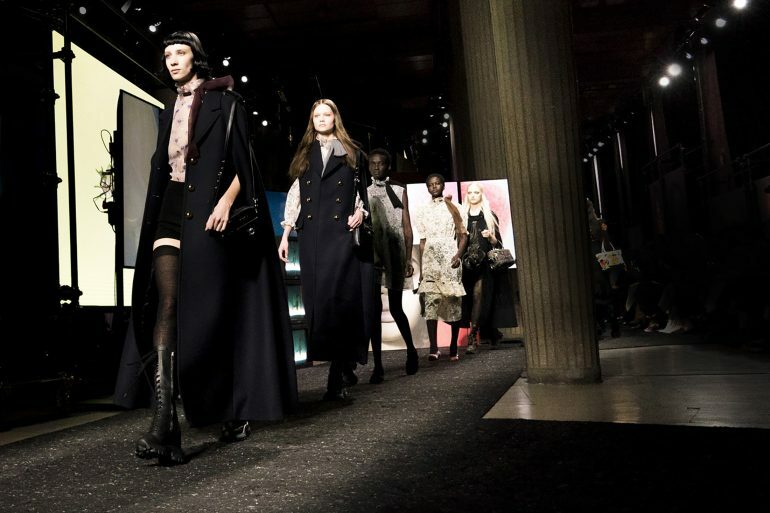 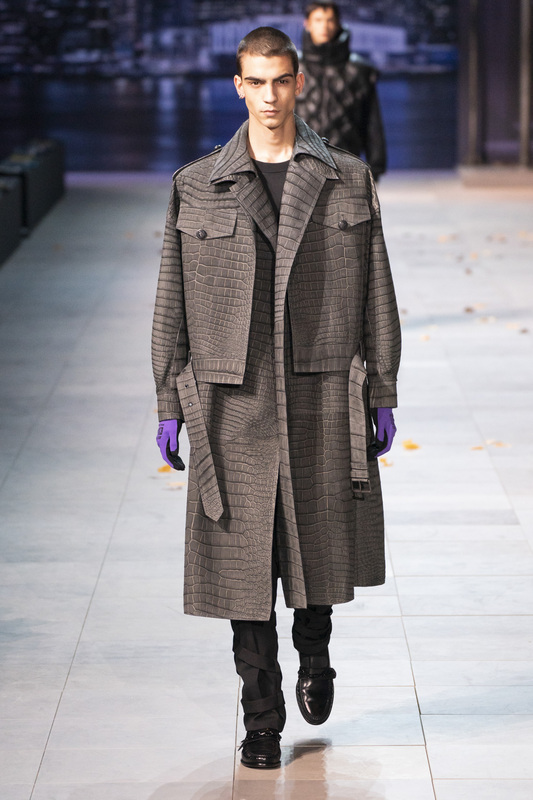 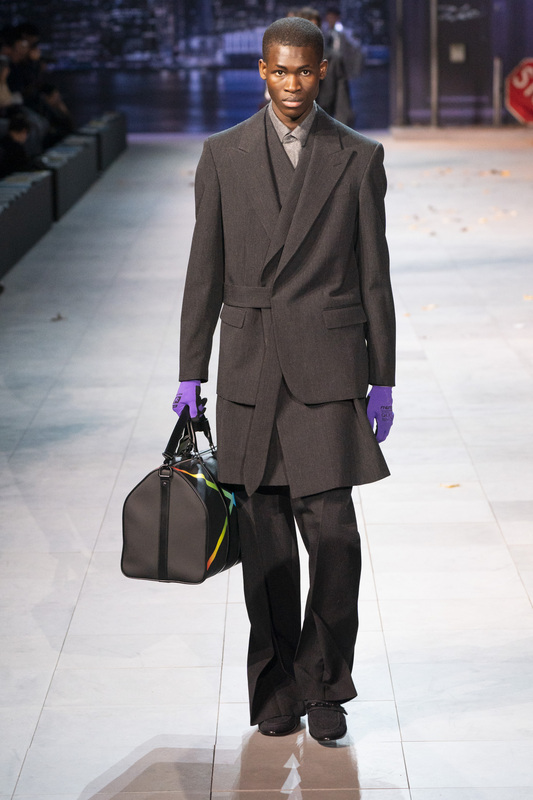 Models wore sparkling gloves, fedoras that nod to Jackson’s performances for Smooth Criminal and Dangerous, wayfarer style sunglasses from MJ’s Bad era, and military and sparkle details. 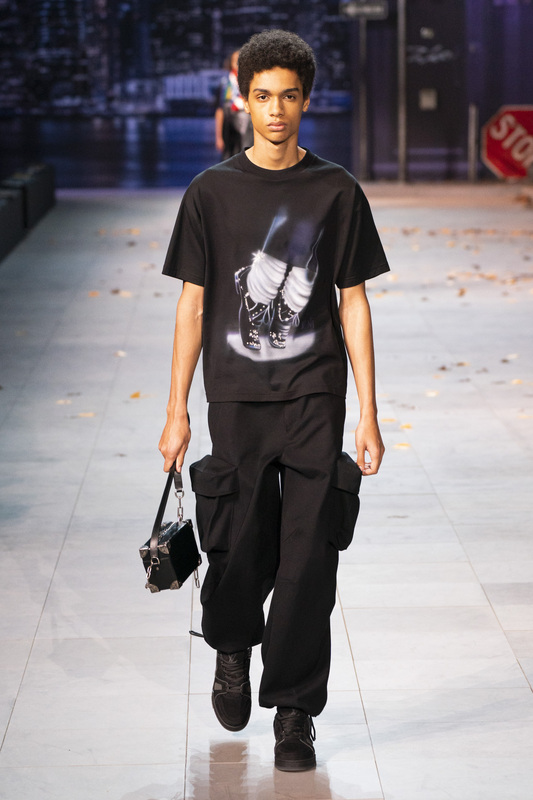 Abloh pulled directly from MJ for a black, blue and red sparkling t-shirt inspired by the singer’s outfit from the 1984Victory tour, his last tour as part of The Jacksons, a t-shirt bearing a close-up of MJ’s iconic shoes and sparkling socks, as well as full red ensembles for the iconic Thriller outfit. 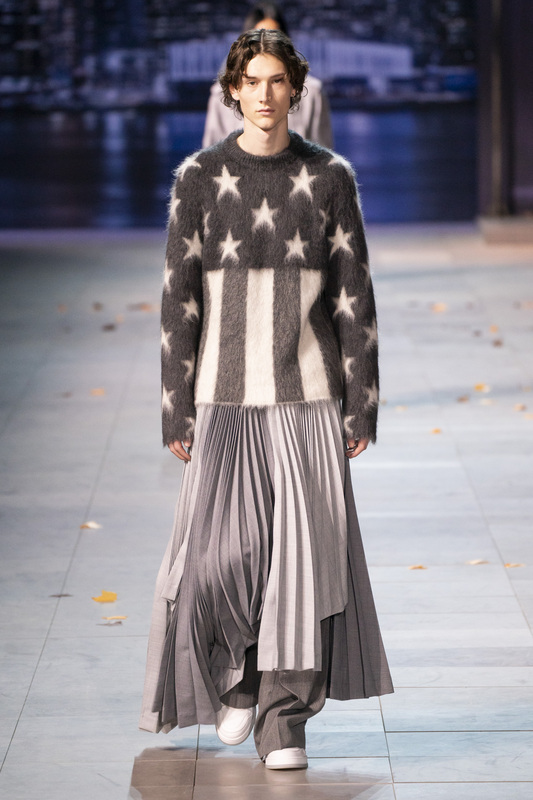 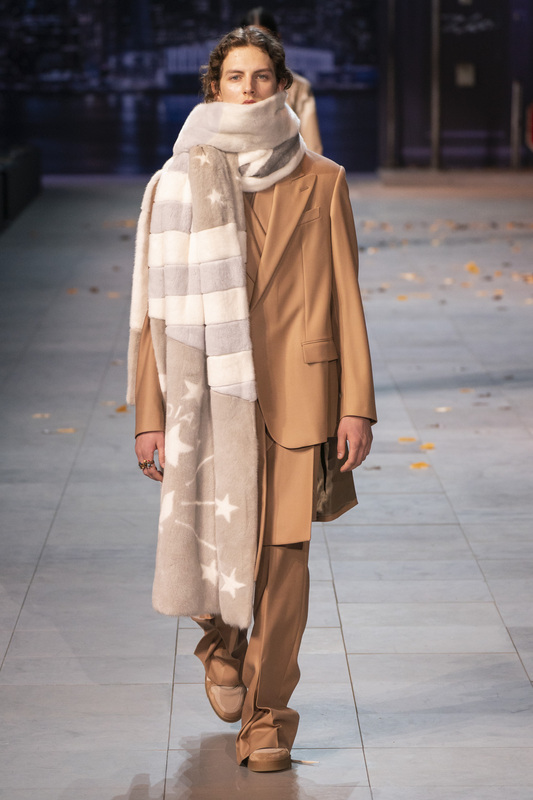 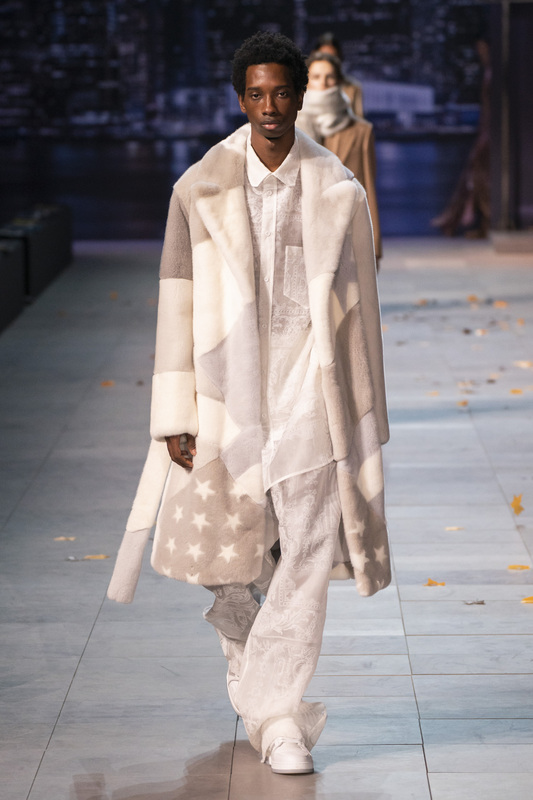 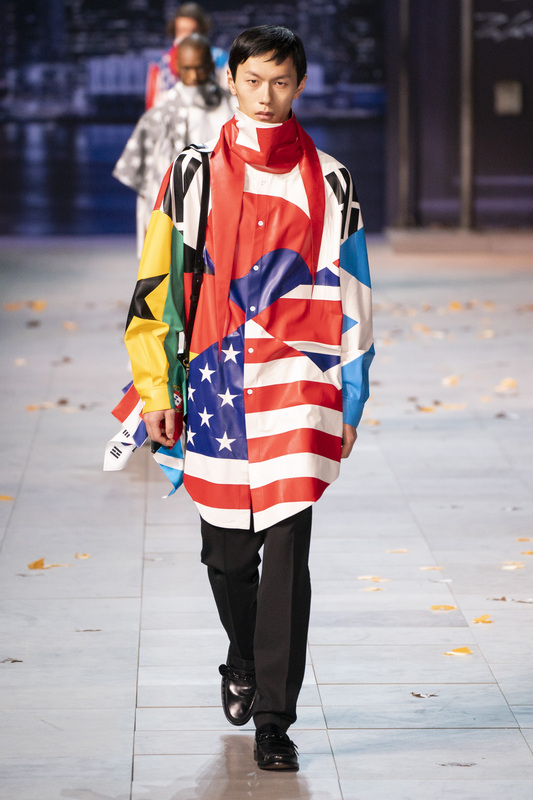 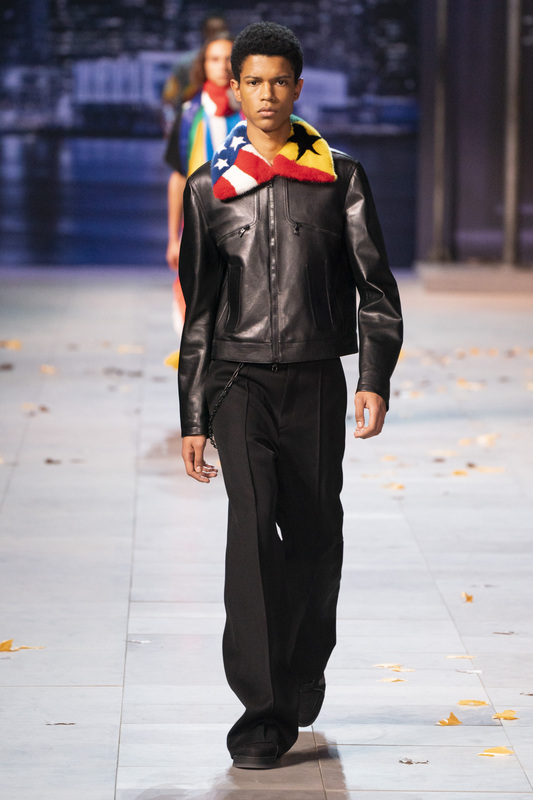 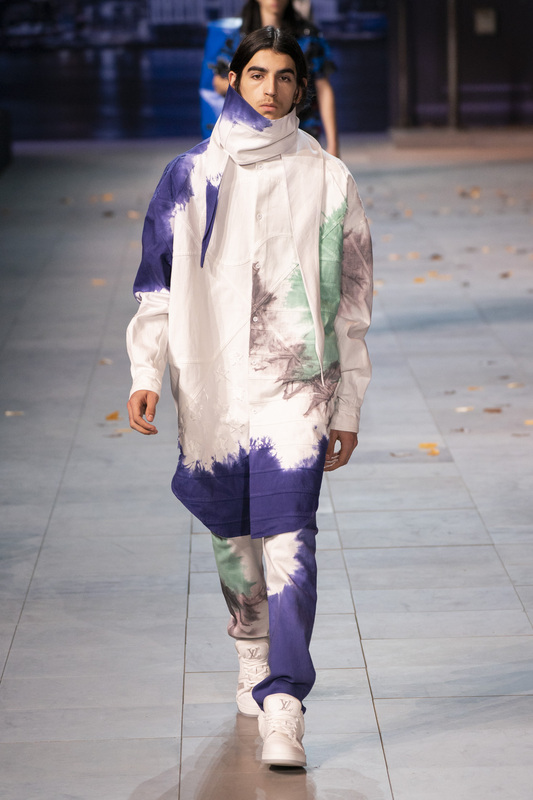 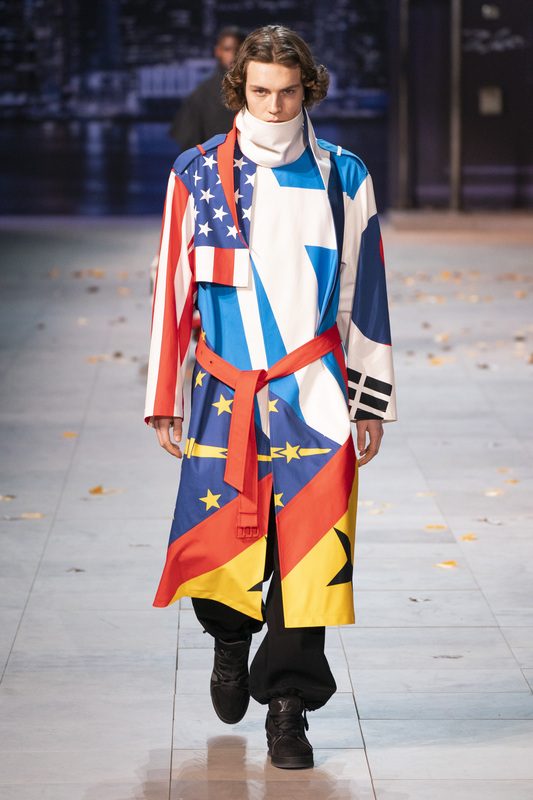 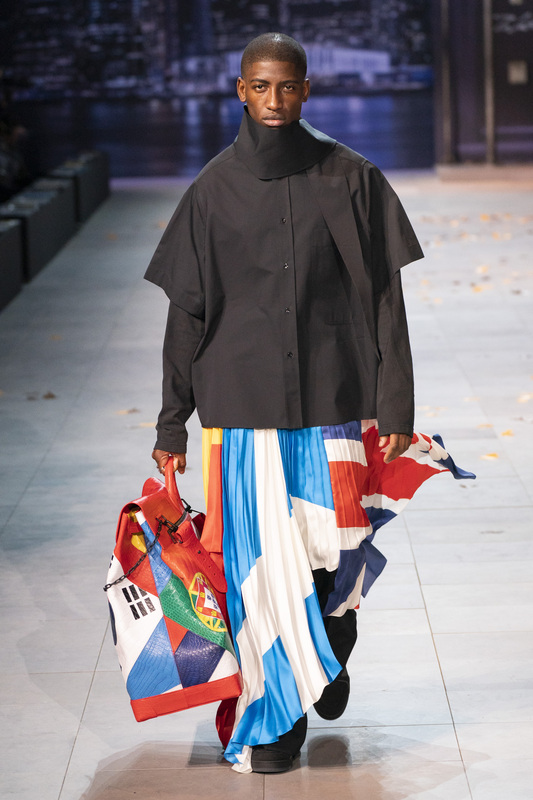 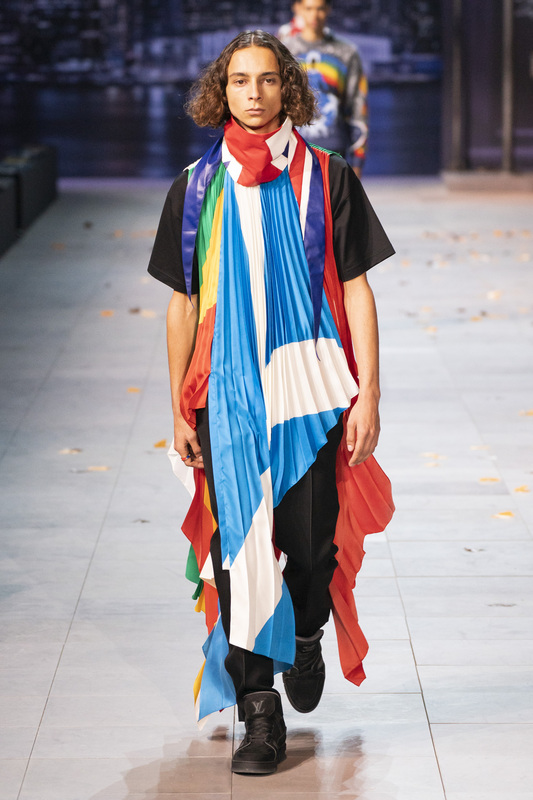 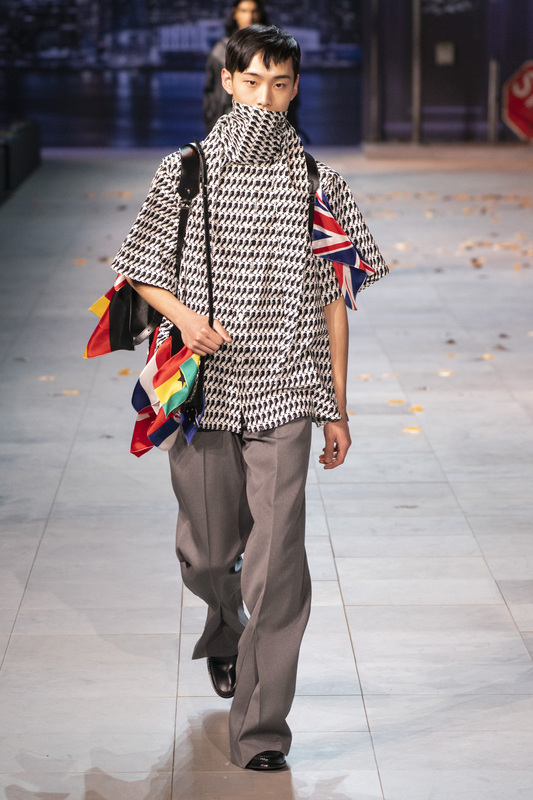 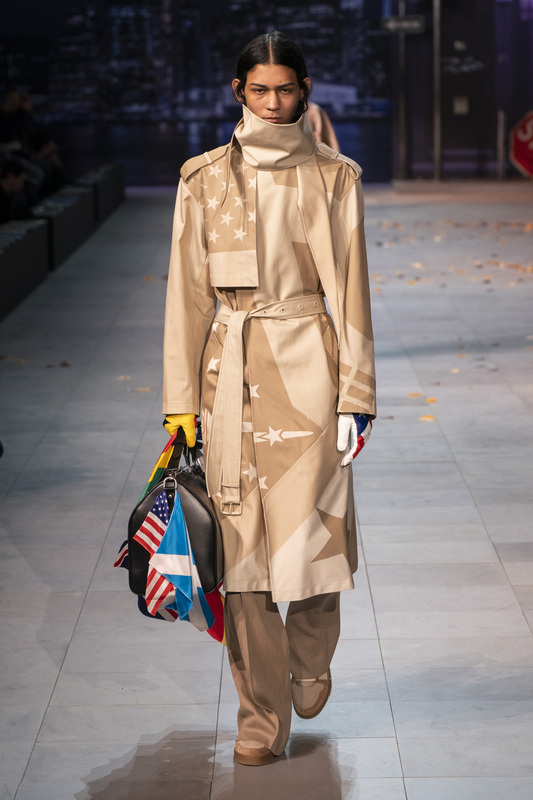 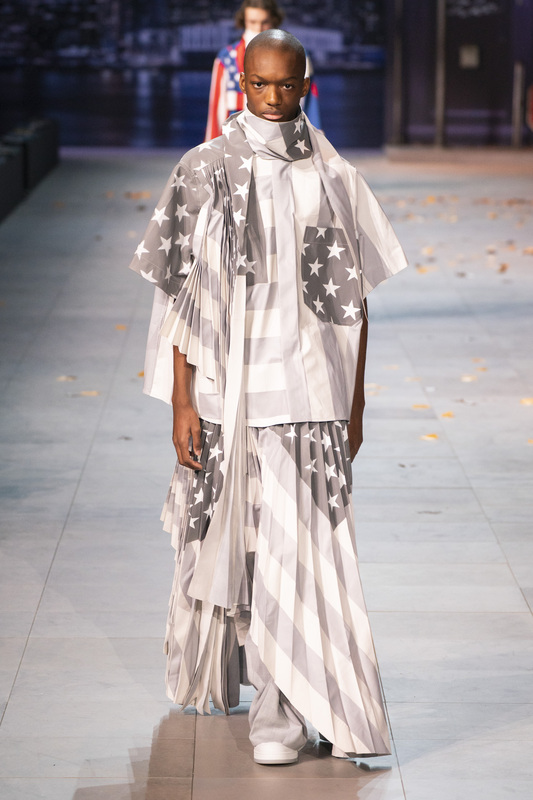 Finally, monochromatic stars and stripes on outerwear and scarves, country flags and globe graphics reference Jackson’s collaboration song We Are The World with Lionel Ritchie, Stevie Wonder, Diana Ross, Ray Charles and more under USA for Africa. 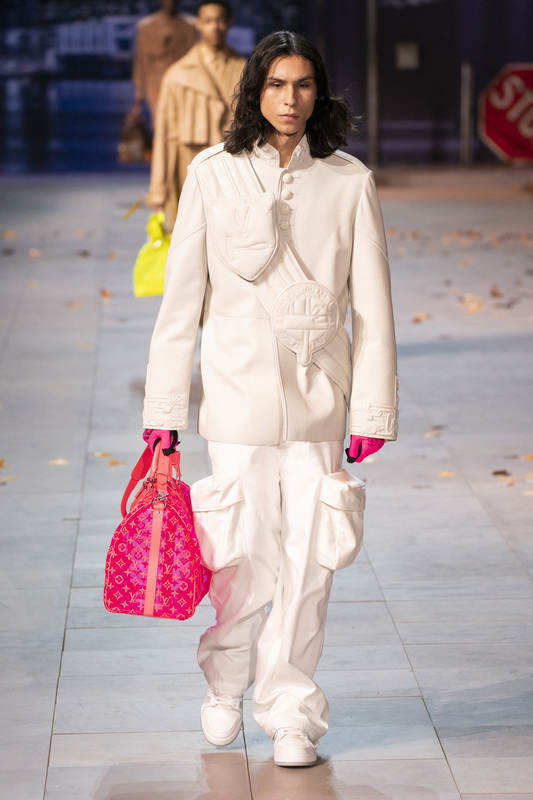 Additional guests included rapper Offset of Migos, rappers Gunna and Skepta, Tremaine Emory, French DJs Justice, actors Joel Edgerton and Takanori Iwata, singers Kris Wu, JJ Lin, and J Balvin, model Natalia Vodianova and artist and cinematographer Arthur Jafa. 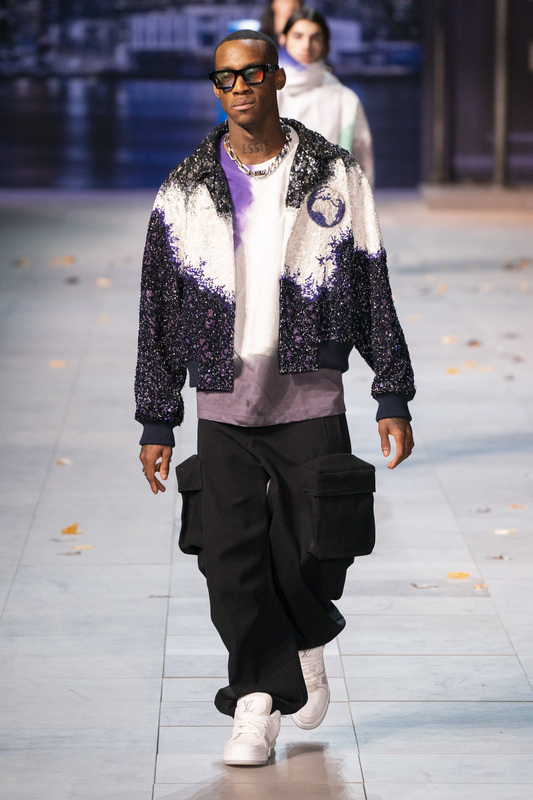 Graffiti artists Futura, Jim Joe, and Lewy BTM created a live installation during the show.